We are quite familiar with windows 7 or Windows 8 operating systems in these days. Perhaps, It is essential to know all possible tips and tricks to get advanced level of understanding the operating Systems. 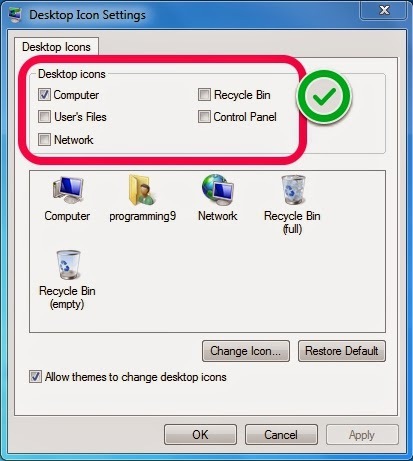 So let us know simple tip of hiding Recycle Bin and other main icons on those desktops. So let us start the procedure for the same. How to Show or Hide Recycle Bin. STEP 1: Right click on desktop and select "Personalize" option from the menu. STEP 2: In the personalization window, find "Change Desktop Icons" at top left side and click that option. STEP 3: You will get a new popup window titled "Desktop Icon Settings" with many Check Boxes. STEP 4: There are Five Desktop Icons with their check boxes are available in that window. See the tick mark in the above picture for clear understanding. Just enable the check box to display that icon on the desktop and disable the box to hide from display on desktop. You can see the video reference for the same procedure.